A comparison of the visible, near infrared, and thermal infrared views of Jupiter. The thermal-infrared image shows the heat from the planet's surface, rather than the light reflected by the sun, and allows for greater understanding of the turmoil in the Jovian atmosphere. After Jupiter returned from its journey behind the sun last spring, astronomers were astounded to find it had only one of its two famous stripes. Scientists still haven't nailed down the processes involved in the fadeout of Jupiter's Southern Equitorial Belt, which happens every few decades. However, new high-resolution images captured by the Keck II telescope in Hawaii have shed some light on the mystery, revealing that Jupiter's upper atmosphere wasn't solely responsible for the vanishing act. "The whole fade and revival of the Southern Equatorial Belt is a bunch of changes in the clouds," researcher Mike Wong of the University of California, Berkeley told SPACE.com. "We're trying to figure out what causes this process and how the changes are related." Wong and his team used the adaptive optics capabilities of the Keck telescope to compensate for atmospheric distortion and take high-resolution images of Jupiter. But they also utilized a less-common instrument — a Jovian moon — to improve the pictures. Adaptive optics cancels out interference from Earth's atmosphere, allowing for more-precise extraterrestrial images. To measure and remove atmospheric interference from their data, scientists usually create a mock guide star, using a laser. But Jupiter shines so brightly that it would obscure the guide star. Instead, Wong and his team used the moon Europa to calibrate the optics. "In this case," Wong explained, "Europa happened to be near the planet during our scheduled observing time [when] the outbreak was visible on Jupiter's disk." In other words, it was at the right place at the right time. 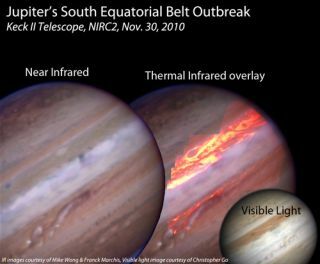 The resulting thermal infrared images from Keck captured not only the light reflecting off the planet's clouds but the heat from Jupiter itself. "We can see very deep, but only in regions with very little clouds," Wong said. In these areas, astronomers were able to analyze the cover below Jupiter's outer atmosphere of Jupiter in search of a better understanding of the mechanics behind the vanishing stripe. The thermal infrared images reveal clouds in regions that appear to be dark — places that, it was thought, would have been cloudless. Scientists could see that the activity behind the rise and fall of the belts does not occur just in the upper atmosphere. "We know these phenomena extend to deeper levels," Wong said. Since the images were taken in November, the southern belt has gradually become clearer — "but not evenly," Wong said. Within a few months, scientists predict, the band should be back and Jupiter will be presenting its familiar face to astronomers everywhere.